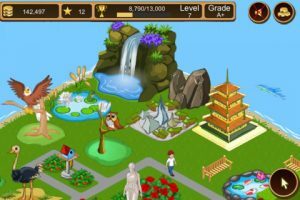 Perfect for those with Obsessive Compulsive Disorder, and a nightmare for those who have trouble controlling their spending habits, Tap Zoo from Pocket Gems falls squarely into Farmville territory. It’s a title that’s less about building and maintaining a functioning zoo, and more about sapping your wallet dry via micro-transactions. 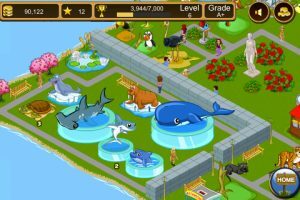 Can Tap Zoo be played without making in-game purchases? Sure. But it’s not designed to. In fact, making in-game purchases is the only way to keep Tap Zoo from feeling like a tedious chore. 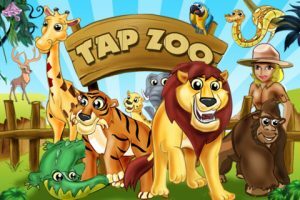 Games like Tap Zoo have been around for ages. The premise here is that you’re given a tiny plot of land and a handful of in-game currency and set off on the task to build a zoo. You begin by selecting an animal and placing that animal on your plot of land. Visitors then begin to arrive, generating revenue for you to reinvest into your zoo. From there, a number of choices are open to you. 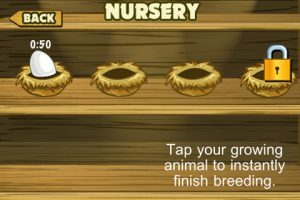 You can begin to breed your animals, add more animals, build other attractions like food stands and exhibits, increase the size of your zoo, or add decorations to your zoo, making it more aesthetically pleasing. You’re rewarded for all of these actions through virtual coins, bonus stars, and leveling up. That, in essence, is the game. Where things start to get tricky is when you factor in the artificial limitations that are worked into the game. Would you like to breed your animal? No problem! You just have to wait an hour for it to process. However, for a nominal fee you can get your new baby gorilla immediately. KA-CHING! Would you like to buy a lion? Sorry, you don’t have enough coins yet. However, for a nominal fee you can purchase more coins. KA-CHING! Would you like to breed more than one animal at a time? No problem, just buy another nest. KA-CHING! There’s nothing wrong with micro-transactions and in-game purchases, but when they are an integral part of the experience, making the game far less enjoyable without utilizing these features, it’s a problem. Without shelling out money, Tap Zoo grinds to a halt, forcing the player to wait hours in some cases for anything significant to happen. That’s not to say that Tap Zoo is all bad. 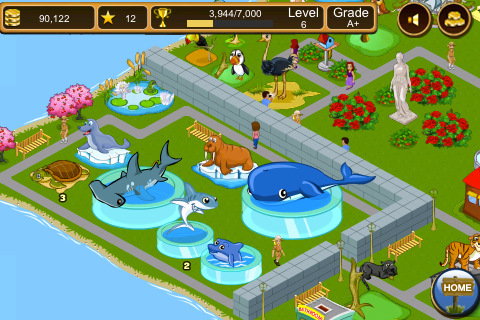 There are some nice features included in the game, such as the ability to visit zoos belonging to other players. You can travel to these zoos, complete a task and help out the other player in order to – you guessed it – earn more currency. In addition, players are able to connect through Facebook and Twitter in order to ask for help or simply brag about the state of their zoo. Bottom Line: Tap Zoo is a revenue-generating app, and little more. The game itself exists only to make money for the developer, and only those who enjoy obsessively tending to their zoo will be able to squeeze any enjoyment out of this “game”. Tap Zoo is compatible with iPhone, iPod touch, and iPad. Requires iOS 3.0 or later.